There are a few classes of integrons, but the first to be discovered and most well-known are the Class 1 integrons. Class 1 integrons are the most medically important class because of their involvement with antibiotic resistance in pathogenic bacteria. As shown in the diagram on the right, Class 1 integrons are defined by the presence of a conserved sulfonamide resistance gene on the outside of the array. 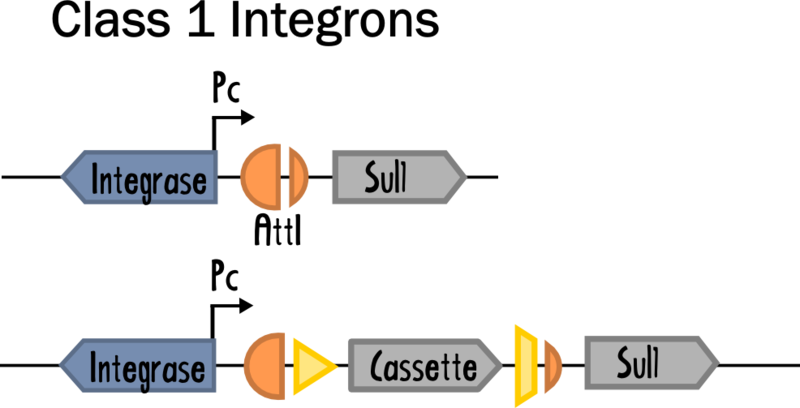 The cassettes found within class 1 integrons are usually antibiotic resistance genes. Since the integration of new cassettes is simultaneous with expression by the constitutive promoter, the system can conceivably be used for pathway optimisation by gene shuffling. This means that new insertions are immediately tested and selected for if beneficial. An extensive review about integrons can be found here. We are seeking to design biobrick compatible, completely controllable class 1 integron components that can be used as a novel, convenient and selective cloning system in lab strains of E. coli, which normally do not contain integron systems. Additionally, we are investigating regulation of natural transformation mechanisms in E. coli in an attempt to allow uptake and recombination of attC containing genetic elements with added convenience. By re-building nature’s modular genetic shuffling machine, we aim to provide a novel tool for Synthetic Biologists AND ALSO create an experimental system in which we can more precisely understand integrons. Nature Review Article talking about Integrons and bacterial evolution. Earlier Review by University of Sydney Professor Ruth Hall.